Survive! Whether you consider yourself a “prepper” or have a fascination with the impending zombie apocalypse, your primary goal is to survive. Imagine the peace of mind you would enjoy, if you never had to worry about that again. 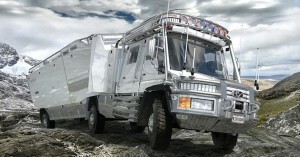 Meet the ultimate survival RV, the KiraVan. It was designed to travel anywhere on land. With a specially-designed suspension system, it has been rumored to be capable of ascending slopes up to 45-degrees steep. It is able to drive as many as 2,000 miles before refueling. 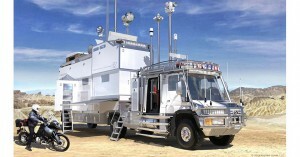 Additionally, at 31-feet long and about 10-feet high, with a security system that rivals those of the wealthiest and most paranoid, the trailer is the real gem. 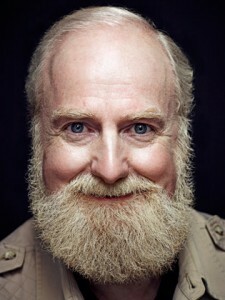 Bran Ferren is a man of many talents. He is an acclaimed architectural designer, artist, engineer, entrepreneur, inventor, lecturer, light and sound designer, photographer, scientist, technologist, visual effects artist, –oh–and a vehicle designer. Born in 1953, he has served as the President of Research and Development at Walt Disney Imagineering, founder of Associates & Ferren, and Chief Creative Officer of Applied Minds. He created the visual effects for movies, such as “Star Trek V: the Final Frontier” and “Little Shop of Horrors,” plays, such as “Cats,” and concerts for Pink Floyd, among others. At Applied Minds, inspired by his love and concern for his daughter Kira, he created the KiraVan. It took a lot of time and money, but when it was done it was a fortress on wheels. 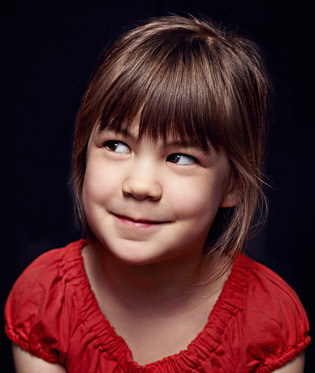 Born in 2009, Kira quickly changed her father’s life. He reduced the number of projects he was working on, as well as the amount of time he worked on them. He began to think about her future. When he was a child, his parents provided him with a variety of experiences traveling the world, and encouraged him to explore his surroundings. He wanted to bestow Kira with the same opportunities, but up a level. 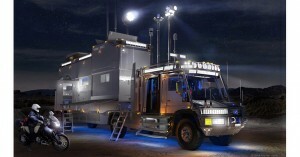 He spent about four years, and millions of dollars, creating this ultimate, all-terrain, expedition vehicle. He named it the KiraVan, in honor of his daughter. With her by his side, he envisioned many adventures. 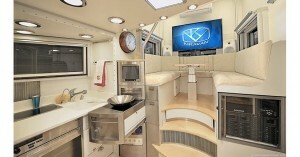 The KiraVan features a separate cab and trailer. It has a Mercedes-Benz diesel engine, with about 260-hp. When in four-wheel drive, the maximum speed is 70 mph. When driving in six-wheel drive, although the top speed is only around 30 mph, the vehicle can take on any terrain. 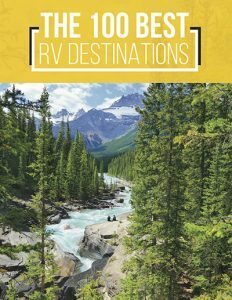 This includes rocky mountainous areas, swamps, and even small bodies of water. The custom-made, nitrogen-hydraulic suspension provides a smoother ride. The 46-inch tires have Kevlar shields. This helps to avoid skidding and also reduces the risk of suffering a punctured tire to almost zero. With his experience in vehicle design, nothing was left to chance. 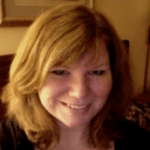 Ferren talked to those who designed mining equipment, and other specialized machinery, to ascertain what to include and what was unnecessary. 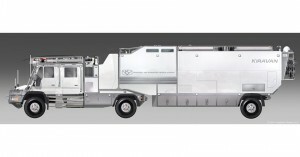 The KiraVan also comes equipped with a diesel-powered motorcycle, which is stored in the back. Referred to as a “dinghy,” the bike enables excursions away from the survival RV, such as for the purpose of scouting ahead. The cockpit looks like something from a science fiction movie set. It has a series of overhead, dash-mounted touchscreen displays. These monitor the vehicle and its progress. Twenty-two cameras provide infrared, thermal imagery of the road’s temperature, as well as a view from all sides. The cameras are controlled with a joystick. The cockpit features a unique vibration-reducing chair, as well as shock-absorbing seats for a more comfortable ride. 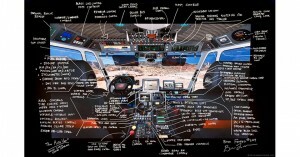 Thinking of everything, he even installed controls for drones. 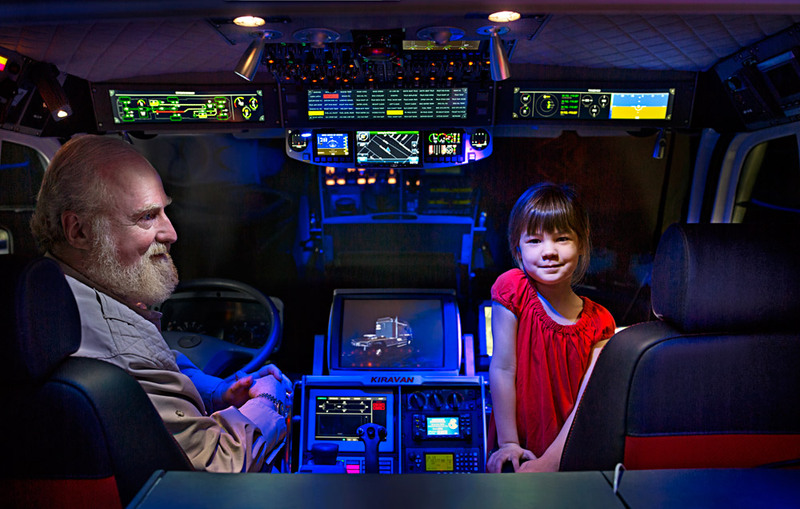 This allows him to virtually fly ahead and check road conditions, or traffic, as the ultimate survivalist should be able to do. 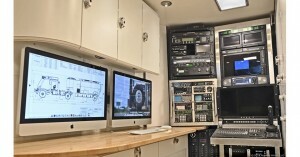 Within the trailer, two computers and a separate control center allow him to monitor every aspect of the vehicle, inside and out. The living space is sleek, modern, and comfortable. 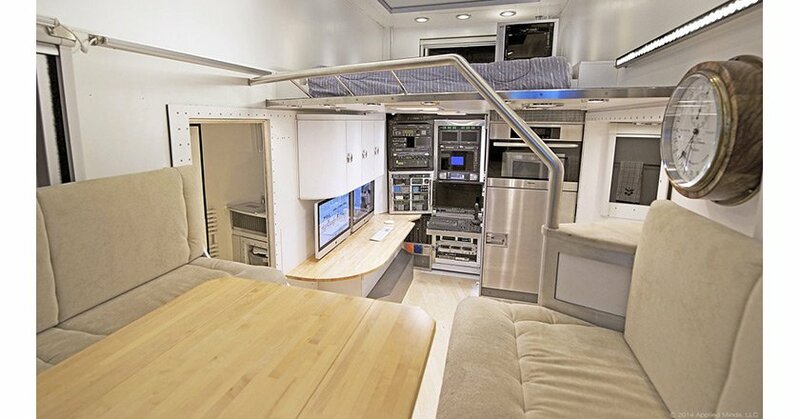 With plenty of space, it is more of an apartment-on-wheels than a survival RV. The “penthouse” is Kira’s place. It provides ample space and comfort. Plus, she even assisted in designing it. 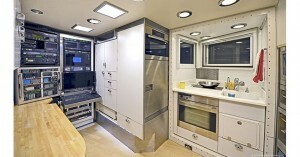 The custom-designed kitchen is truly “space-aged”. 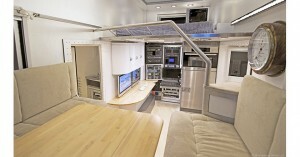 It has all of the comforts that you would expect, including an espresso maker. The kitchen is outfitted with enough food and supplies for approximately two weeks. With additional storage space, that can be expanded if needed. 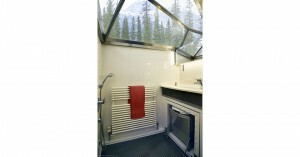 It also has an eco-friendly bathroom, which is a no-frills area that gets the job done. 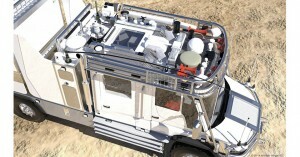 The satellites and multiple antennae are expanded when the vehicle is stationary. 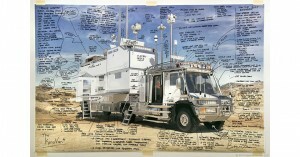 These are what provides the rig with communication capabilities. Oh, it also has an aircraft emergency beacon, just in case. 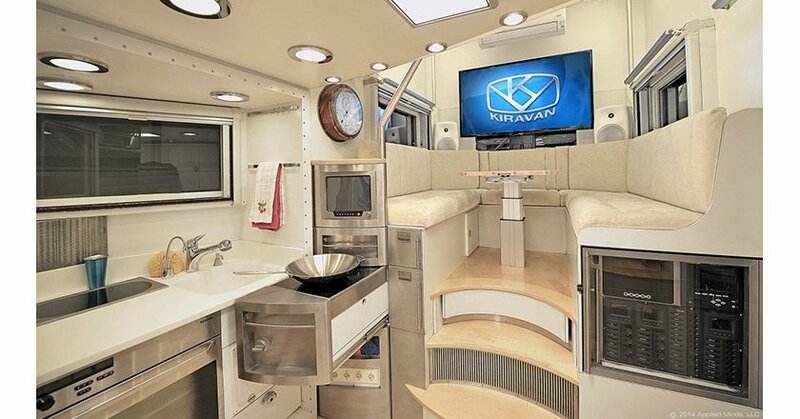 Whether you are “prepper,” or merely stocking up in case of an invasion of the undead, let the KiraVan survival RV provide you with the inspiration you need, to take it to the next level. With the creativity that comes with being designed by a past Disney innovator, nothing has been overlooked. Chances are, if anyone actually comes up with anything that could improve it–Ben Ferren would be the first to implement it. As you can see, this vehicle is truly one-of-a-kind. 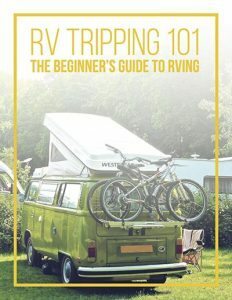 It is a dream-come-true for RV enthusiasts, sci-fi fans, and admirers of all things odd. Please share this with your friends and family; it’s really just too cool not to.